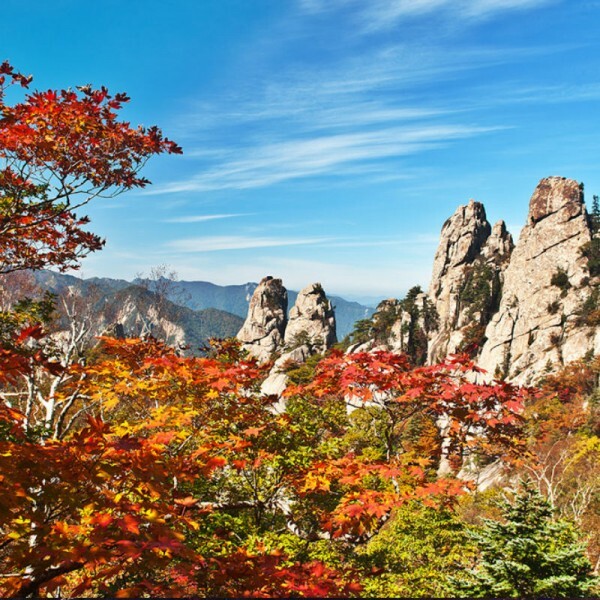 Inner & South Seoraksan Autumn Foliage - 2 seats now available! Due to illness, 2 seats are now available. Yeri Choi & Tom Coyner, current RASKB General Managers, will be conducting this excursion. Tom went on this tour last year. We have reserved a Mercede-Benz minibus that promises a comfortable ride. We still have four empty seats that may be reserved on a first come, first served basis. We will go to Seoraksan National Park's Inner & South Seorak to view the autumn foliage within a one-day excursion. We will leave Yongsan Post Office at 8:am and will arrive at the Seoraksan National parking lot about 11:am. We will take the 20-min. shuttle bus up into Inner Seorlk to Baekdamsa temple. You will have a choice to buy a Korean lunch (bibimbap) at the restaurant near the parking lot or you may enjoy your own box lunch that you may bring along. After lunch, we will take a 1-hr bus ride to South Seorak to the Yongso Waterfall. We will then walk down on the hiking path for one hour before returning home by bus. Walking shoes or hiking boots and warm, comfortable clothes are recommended as we will be walking along forest paths. Please be sure to check back to here on the RASKB web site on Thursday, October 25, to see whether we are confirming or cancelling this walk. To register, simply click here by Thursday, October 25, 2018 Please wait for a confirmation before making a payment.